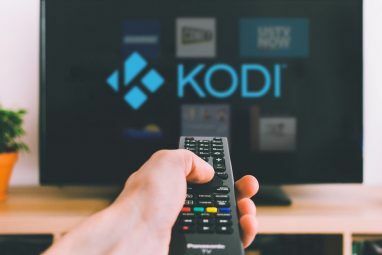 If you’re in the market for a new TV, 4K or UltraHD are two terms you need to know 8 Common Terms You Need To Know Before Buying Your Next TV 8 Common Terms You Need To Know Before Buying Your Next TV When you go out to buy a new television, you might be a little confused by the many options available, all the features they have, and the jargon you need to wade through. Read More . 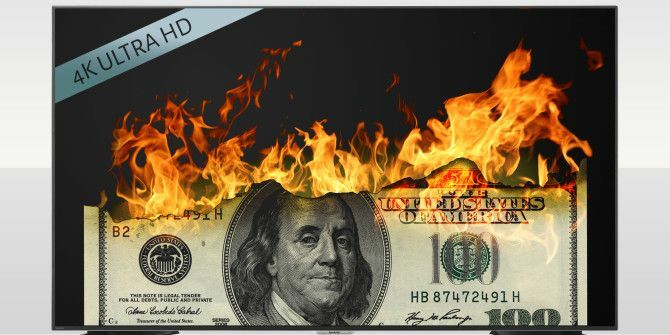 The next step is figuring out whether you really need 4K, because there’s an obvious price difference between the new generation of 4K TVs, and older Full HD models. Spoiler: No, you don’t need 4K. What Is 4K Or UltraHD? Simply put, 4K refers to the resolution of the screen. There is also 8K, which is twice the resolution. Both 4K and 8K fall under the bracket of UltraHD. The resolution of the more common Full HD TVs is 1920 x 1080 pixels (otherwise known as 1080p, but note that this refers to vertical resolution, while 4k refers to horizontal resolution). In comparison, 4K is 3840 x 2160 pixels, and 8K is 7620 x 4380 pixels. So, why are 4K TVs a waste of money right now? The big question is whether 4K is actually noticeably better than Full HD. THX, the digital audio and video mastering firm, says the golden number is 55 inches and 6 feet. If your TV is more than 55 inches and you are viewing it from a distance of 6 feet or less, you will actually notice the difference between 4K and Full HD. If not, forget about it. Sit further away, and the benefits are lost; you’re unlikely to notice any difference between the two resolutions even if a 1080p television sits side-by-side with a 4K one. I’ve witnessed this personally, both at trade shows and in stores. HD was an obvious upgrade over what we now called “standard definition” content, but the jump to 4K isn’t as obvious. The bottom line is that the conditions where UltraHD becomes relevant are unrealistic for most homes. A screen in excess of 55 inches with a viewing distance less than 6 feet is highly unlikely. In fact, that’s going against the recommended formula to buy a TV for your living room TV Buying Guide: How To Pick The Right TV For Your Living Room TV Buying Guide: How To Pick The Right TV For Your Living Room When it comes to buying a TV, there's a lot more than what's on a spec sheet. By the end of this guide, you'll know exactly how to pick the right TV. Read More . If you want to be absolutely sure, try out this 4K calculator to see if you’d benefit from it. All right, let’s say you’ve decided to buy 4K model regardless of the above math. There’s a bigger problem: standardization and compatibility. H.265 or HEVC: You’ve probably heard of H.264, the video codec used by most movies and TV shows for streaming on services like Netflix. Well, H.264 isn’t good enough for 4K. So a new video codec was announced, H.265 or HEVC (High Efficiency Video Coding). This new codec doubles the data compression, which means it will be easy to stream videos smoothly on existing broadband connections. But there’s a catch: the new codec is nowhere close to being widely adopted. Dan Rayburn, Principal Analyst at market research firm Frost & Sullivan, says HEVC is at least three years away from consumer adoption. Streaming Media blog adds that none of the major players—Adobe, Apple, Google, or Microsoft—have announced HEVC playback support in their players, browsers, or operating systems (both mobile and desktop). Still, many of the new smart 4K TVs come with a built-in HEVC decoder, so that’s good news. HDMI 2.0: Good news: 4K connectivity is going to work on HDMI. Bad news: It’s a different standard of HDMI. HDMI 2.0 looks like current HDMI 1.2/1.4 and will plug into existing ports too. However, it won’t support a full range of features. HDMI 2.0 can play 4K content at 60 frames per second (fps)–HDMI 1.4 caps it at 30fps. You don’t need 60fps for watching most movies, but it’s needed while playing video games. And the new PlayStation 4 and the Xbox One consoles don’t have HDMI 2.0, so they won’t be letting you play 4K games. Some filmmakers are also opting to shoot movies at rates higher than 30fps, like The Hobbit series and the sequels to Avatar. New TVs come with HDMI 2.0, but most playback devices don’t. Some devices released in the last year or two with HDMI 1.4 might be getting a firmware upgrade to HDMI 2.0–check with your manufacturer about this. Just remember that to take advantage of HDMI 2.0, both devices (input and output) have to support it, not just one or the other. Compatibility: Netflix is supporting 4K streaming on some shows like Breaking Bad and House Of Cards. But even then, it’s not that simple. Netflix actually needs to certify the TVs before they can stream 4K videos, says Consumer Reports. Amazon Prime Instant Video also has 4K streaming now, but it’s unclear whether it requires a similar certification. For offline viewing, apart from the issues with HDMI 2.0, 4K blu-rays will be coming in late 2015, and you can expect them to cost significantly more because a new standard (HDCP 2.2) is expected to make it harder to pirate 4K videos. In fact, Reviewed.com says 4K content is getting delayed to get ready for these anti-piracy measures. You can also download 4K videos from YouTube 4K Video Downloader Makes It Easy To Get Videos From YouTube 4K Video Downloader Makes It Easy To Get Videos From YouTube 4K video is all the rage and YouTube is a great place to watch them. Streaming 4K video can be too bandwidth-intensive, so save and play them with 4K Video Downloader. Read More , but honestly, those are boring and quite limited. Right now, there isn’t much content available in 4K. However, if you’ve got a 4K TV, then the TV has to project in that resolution. So if the source content isn’t 4K, what does the TV do? It cheats your eyes. Several 4K TVs have been known to play with a sharpening effect. 4K content often comes from 2K source footage, and almost always has artificial sharpening effects added — technically a degradation of the original, but a process which adds perceived sharpness. “The sharpening effect would look the same if applied to an HD image instead of a 4k image,” writes cinematographer Steve Yedlin. This is done so that the 4K TV looks better than a Full HD TV in a showroom, when in fact, there is little difference. It’s yet another one of those showroom tricks that cost you money Buying A New TV Or PC? Avoid Showroom Tricks That Cost You Money Buying A New TV Or PC? Avoid Showroom Tricks That Cost You Money Over the years I've become more and more resistant to their tactics and approaches, thanks mainly, I think, to the realisation that they haven't been entirely honest with me. Read More . One of the areas where 4K resolution actually looks noticeably better is gaming. 4K gaming on PCs is stunning despite its flaws PC Gaming at 4K: Is It Worth The Money? PC Gaming at 4K: Is It Worth The Money? A resolution revolution is on its way. Ultra HD televisions and monitors are finally starting to drop to reasonable prices. Has Ultra HD matured, or is it still too much money for too little benefit? Read More . In fact, Matt says he’ll move back to lower resolutions only if the frame rate drops below 30FPS (frames per second). There isn’t a large list of smartphones or cameras that can currently record in 4K definition, so there’s a good chance you will need to buy a new one. There are about twenty phones on the market, five mirrorless cameras, five video cameras, and five wearable cameras like the GoPro Hero 3 and upwards. Check this list of 4K recording devices, and if your camera or smartphone isn’t listed, you’ll need to upgrade. The iPhone 6 and iPhone 6 Plus (reviewed by Tim iPhone 6 Plus Review and Giveaway iPhone 6 Plus Review and Giveaway The 5.5-inch iPhone 6 Plus is Apple's latest and perhaps strangest addition to its range of tablets and smartphones. Read More ) do not make the cut; but you’ll pleased to know the Nexus 6 Motorola Nexus 6 Review and Giveaway Motorola Nexus 6 Review and Giveaway The latest entry in the Nexus devices comes with a $650 price tag, along with outstanding specs, the latest version of Android and touchless controls – but does the ginormous phablet size warrant a purchase? Read More does. A 4K smart TV of 55 inches or more, placed at a distance of 6 feet or less, to actually see a difference in image quality. It has to have an HEVC decoder and ideally support for HDMI 2.0 (for gaming and higher FPS movies). And you have to upgrade all your other hardware, which currently doesn’t support HEVC, HDMI 2.0 and such. Your TV also needs a secure certificate from Netflix to play approved content – the new Roku TVs have this, for instance. You need new hardware in the near future, like the next generation of video game consoles, since the PS4 and Xbox One you won’t be able to play 4K games. Are you still not convinced? What’s your reason for not buying into the 4K fad? Explore more about: 4K, Television. All I watch are DVDs and VHS. All I read is an alien language and nothing translates. But from what I can gather is that this is a desperate ploy to keep everyone to keep spending and wasting their money. If anyone is 'running away with the idea' buying a 4K TV and expecting the same quality through an ordinary TV aerial, then the picture quality will be the same as in a standard HD television. To do the job properly. Don't skim the surface, ask a sales expert on the shop floor and they will tell you that to receive 4K, that it can be received through SKYQ, Nefflix, Amazon and other organisations specialising in these services and at a price. So, to the point. Look into things further to avoid disappointment. i have never done 720p ever.... ive always had 1080p from the beginning...before 1080p.. i had oldschool old tv's.. The reality is this article was obsolete as of april 2016 ..and even december 2015 in some areas. Will plain hd content (not 4k) on a 49" full hd tv look better than on a 43" 4k tv..? bud, go get yourself a 4k video card for your computer and a standard 720p projector and you WILL see a difference and I sit 13 feet away. 4k is not a waste if you do it right! If you are blind, have blurry vision, are required to wear glasses while driving but refuse to wear glasses while watching tv, you may not see the difference. - I certainly can, additionally 4K footage typically has higher contrast levels and better colors. - i have a 55 inch tv and i sit ~12 ft away. Seriously? 720p is crap dude. Just because you're too poor or too cheap to keep up with the times, doesn't make everyone else an idiot. Just you. I'll put my Pioneer 50in Kuro (720p) next to your 4K, you pick the TV, and Play Avatar on Blu-ray @ 1080p on both and watch your jaw drop as my Kuro out performs your overpriced snake water!!! Well, that's not going to happen if watched at appropriate distance. 720P will look crappy at a distance where 4K looks amazing, given that the scales well (like my 4K Sony does). Wow, look art the morons here who think 720p is "good enough". Maybe get a job that pays more than minimum wage then you won't have to justify settling for 10-year old technology. I've heard a lot of this jargon from the so-called 'experts' and I have to say it is total BS. 4K TV's look WAAY better from any distance, any size, any angle. I don't know the reason for the antagonistic approach to the newer technologies but one thing is for sure, the eyes don't lie. See it for yourself before you buy into this bologna. I have a Vizio P-series and I am 10+ feet away and there is a HUGE difference between video quality, if any of my friends come over and I show them 4k content they are all totally amazed. WOW! This article is bullsh*t, and it is biased before it even begins!! I appreciate all the techno statistics; however, I rely on my eyes to verify a great picture. I've got a Samsung UHD 4k & 2160p. Even though 99% of programming is not UHD, the picture is still great! This article could not be more wrong. I have had a Vizio 49 inch 4k now for three months and the picture is beyond description. There is not much 4k content available right now but it does not matter. Standard 1080 gets upconverted automatically and it looks almost as good as 4k does. Even with rabbit ears OTA is orgasmic. Upscaling does not look as good to me, Tom. Let's just agree to disagree on that one. Last week I sold my 1080 TV. I set it up in the living room side by side to my 4k TV. One would have to be legally blind not to see the amazing difference. I think you need to go to a Best Buy and look again. I watched a few nature documentaries yesterday but I rarely get 4k content. I really don't need it since the upscaled 1080 looks so amazing. This TV would be worth the money if I never got to see any 4k content. However next month I will be upgrading my phone and I will be getting one that has 4k video capabilities in the phone. Could you tell me the model number of your Vizio TV please? Maybe it has a better image upscaling engine than the TVs I've seen so far. Vizio M49-C1. To be honest with you I had reservations about buying into 4k so early due to a lack of content so I spent a lot of time at Best Buy and Walmart looking at 4k TVs and comparing them to 1080 TVs. In every case it was not just a question of it looking better but looking much much better. So I bought early. Never regretted the decision especially after looking at my old TV side by side. And my old TV was a top of the line RCA only two years old and in great condition. The most shocking thing for me about upscaled 1080 is the fact that with normal 1080 I can see a distinct difference between live tv, video tape and movies. So different in fact I can tell just by looking at any source if it is live, video tape or a movie. Not so when it is upscaled on my 4k tv. Movies look like live broadcasts, video looks like a live broadcast. I simply cannot tell the difference. Even with very old movies an movies in black and white. I can't explain it but I sure can enjoy it. I couldn't agree more with your article.You forgot to mention the most important newcomer in 2015 - the laser TV projector. 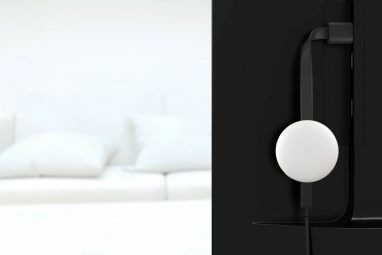 The future TV technology is panel - free display. I am really impressed with HISENSE Vidaa Max, a laser short-throw projector that can beam a 100-inch HD image from an 18-inch distance. The company is currently working on optical engine with a 0.24 throw ratio - that's a 100-inch Full HD image from just 1.7 inches. Although the price of the Vidaa Max is not available yet, Hisense said that it would be "significantly lower than LCD". I think that the introduction and mass production of Laser TV projectors will signal the death of LCD and plasma panel TVs. The most important advantage of Laser TV projector is significantly lower energy consumption and much lower price than equivalent size LCD or plasma TV. The laser is very powerful , far more brighter and coherent light source than LCD or OLED . The laser also produces an incredibly bright , intense and accurate colours. Sony has released a stunning 147-inch, 4K Ultra Short Throw Laser Projector (LSPX-W1S) however the $50,000 price is ridiculous.Samsung, LG and Mitsubishi are focusing too much on USHD, OLED and curved TV instead embracing the world of panel-free laser displays ASAP. I wonder whether LG discontinued the production of Hecto Laser TV projector last year due to fear that customers will abandon their OLED TV in favour of the new technology. Laser Projectors aren't going to be cheap enough for mass consumption for a few years. I agree that it makes the most sense as the TV of the future, I just think we're talking way into the future at this point. 2. The fact that lots of devices support 4K before our Blu-ray/Satellite and Cable Receivers/and other everyday items output it does not mean we won't have a slew of devices like the Google Chromecast (version 2) sticks/Playstation 4/Roku 4/ IP Cameras | Network Video recorders (What I'm going to go over in detail as my last point) - I believe for a niche group of us, 4k and 8k UHD TV's will have an extra appeal. I'm already gaming on a UHD TV. There will be a market that will help sales, even a tiny bit. - 1. There are *some* manufactures that make a baseline panel for different models of HDTVs to gain the savings of manufacturing a fewer variants on parts. So, you may have a OEM making a panel for a 55" that they also use on their 50", but they are still selling what are now considered small HDTVs that are 32"'s (for a good laugh take a look at this LG’s new 440 PPI display is way too much). So as we migrate to 4K there will be fewer models below 50", and I believe there is more potential -- for economy of scale purposes --, they may start having more baseline screens that have actual higher PPI than what the onboard scaler is showing (still adding a tiny amount of crispness to the display. So as the new generation of (what are usually as few separate chips as possible i.e. SoC) upscalers/dual and quad core embedded processors/HDMI 2.0a signal processors etc - become more mainstream "off the shelf" and mass produced, they can start adding these parts to the 1080p based TV's (again for economy of scale reasons) -- so in short, the only reason they don't get to put the 4k UHD moniker is the screen's PPI - thus encouraging them to merge the panel production lines. - Conclusion on my point:The 4k related upscaling processor, mainboard CPU, HDMI stream processor etc, are typically all the same once scaling production is driven up and drops the price. So when I come across articles like this saying so few will tell the difference and it isn't worth the money (There is a CNET article stating no one should waste their time on UHD TV), I like to give the input from those of us who don't just argue the 4K Roku/Amazon Fire/Play for PC's Videocard crowd (aka video on demand stuff) that yes, it is rare that we have true content. - The big expensive price hurdle for the UHD TV's that will be showing 4K content natively (not using an external device) is decoding H.265 HEVC (High Efficiency Video Coding) content, which only Smart TV's playing content themselves, like from Netflix's 4k content - isn't too much of a show stopper. For me, I am fine with a basic HDTV that is nothing but a display with hopefully a good picture for the price. I play VOD from my laptop in bedroom and PC of office. Others will use dedicated devices like Roku 4 and the others I've mentioned. More of the last generations of HDTVs HAD to have a dedicated mpeg-2 and (and now for Smart TV's) mpeg4 ASIC component. But now that TV's, even completely "dumb" ones, still "boot up" they are moving to faster and faster System on a chip (SoC) processors. But now the Smart TV's that have Video on Demand software like Netflix built in, the systems are coming with beautiful gems like ARM Processors with H.265 support that they can decode multiple streams of H.265 HEVC content on their own, without a dedicated ASIC. So that's it for my debate point on both why I believe the costs of 4K will start to probably have no more than a premium of 10% cost, they may also becoming mainstream quicker than the writer of the article suggests. We tech geeks want it for the real reasons such as mine (see next point), the consumers just like bigger numbers. Also, from what I've seen of the latest upscaling technologies, along with OEMs adding ARM processors that are becoming so powerful and inexpensive (Thanks to the tablet and smartphone market pushing them so hard) the resources needed to upscale maybe all built into shrinking mainboards driving costs lower much more quickly than we suffered with the first large 1080p screens. I just put my pre-order in for one of these bad boys Dahua DH-NVR608-64-4K 64 Channel NVR 4K Super NVR Recorder for IP Cameras -- It is a security camera Network Video Recorder (NVR) that reads/displays/saves video streams from IP cameras. It has TWO HDMI ports, each capable of 4k output (just like a multi-screen PC display). So, pick up a couple $400 4K TV's such as from deal/coupon sites (This is not spam!) Bens Bargains "HDTV 4k" deals and coupons 4k HDTV deals - They just had the same $400 deal I got on 2014's Cybermonday, $400 for a very basic 4K UHDTV -- anyway to my point, I have no 4K sources except my computers (p.s. AWESOME looking desktop and gaming!). But once I get this NVR I'm considering getting a second 4K HDTV, wall mounting them both side by side in my office and feeding them with the new 4K NVR. I have 24 HD cameras sources. Right now they show on a 32" 1080p el-cheapo HDTV as well. - Many people aren't aware that there are now 3mp, 5mp and the 4k (8.2mp -- shipping mid-summer '15 I think?) cameras. Meaning the old NTSC security systems that at best had 480x700 (D1) true resolution could natively, without downscaling -- pixel to pixel -- could pixel-losslessly display 2.25 cameras per horizontal grid by 2.74 cameras horizontally on a 1080p monitor/HDTV. On a 4k (3840 x 2160) display, you get 8 cameras wide and 3 cameras tall (grid layout) without downscaling. ---- On the next 3 systems installed, for family, I used 3mp and a few 5mp cameras. Back to the implications that a UHD 4k HDTV/Monitor (same thing anymore), with just one 4k monitor - I can display (4) 1080p cameras -- 2(h) X 2(V) -- Big deal you might say? So I gained a little native resolution to avoid actual loss (due to downscaling). Not many people are picturing the sources that some of us will be feeding. As it stands now, I may be putting in a system in a couple months for my uncle (I'm the family nerd) and he wants all 5mp cameras, he may even put a few of the 8.2mp units in. So if I have 16 cameras, in short -- I want as many pixels as possible. Sure the NVR records it at any resolution I want, and yes 2mp looks pretty good. But I can't read license places on my 2mp system. 3mp gets closure - but the end goal is to have 8.2mp cameras which if I go full screen with - whammo, I'm actually getting to see all of (or close to all?) of those H.265 HEVC encoded pixels. My apologies for not reading this comment earlier, but my word, that's a fantastic reply. I would love it if you could get those hyperlinks and add them here, Aaron, just so I have some reading material for the weekend! Personally, I would hold off on buying a 4K TV until the 4K Blu Ray specs are finalized. When I bought my Sony XBR LCD back in 2005, there was no Blu Ray yet (in stores, at least) but at least I could watch cable in 1080i resolution. Even the OTA signals blew Comcast's "HD cable" out of the water in terms of picture quality but for a few years now, OTA hd signals have all been blacked out by Comcast in my area. It might, but software-decoded 4K isn't going to look that good at the frame rates which games need to run at. 4K is great for a computer monitor - because it's 2 feet in front of your face. Even then you'll want a 30"+ screen. IMO this is a monitor technology, not a TV technology. I'm more interested in seeing OLED tech coming to large screen TVs at 1080p than 4K in the living room. I'm with you there, Sri. OLED > 4K any day. As with the current TV broadcasting in the Philippines, the answer is no since we are still on the process of migrating from analogue to digital broadcast, this is the first. Second, whenever the migration completes, there is still no possibility that the TV networks here will broadcast in 4K. Third, I don't think the networks here will invest on filming nor in broadcasting in such resolution. 1920 x 1080 is just fine for a 480p broadcast. I wonder though how will a 4K tv display a 480p video. I also look forward to the usage of H265 codec in TV broadcasting. "Assassin's Creed: Unity developer Ubisoft has defended its decision to lock both PlayStation 4 and Xbox One versions of the game at 900p and 30fps." Xbox One and PS4 are current gen consoles, not next gen. They are also struggling to generate 720p 30fps graphics for many high profile games (the 'cinematic feel' controversy), let alone 1080p at 60 fps. All these articles based on the primise that some technology 'X' is useless or wasteful because it isn't needed or it is too young. They're all ignoring the fact that technology itself isn't necessary, and we only advance by trying new things, not by saying we will eventually try new things. I've been waiting for the screen resolution stagnation to end for almost 10 years. Now that it's actually happening, everyone falls over themselves to write articles attacking the intelligence and financial wisdom of anyone who would not be satisfied with the status quo. Sorry, but the only complaints I've heard about "current gen" consoles struggling with full 1080p is the Xbox One. PS4s...not so much. 720i vs 1080p, no. 720p vs 1080p, yeah. Again, depending on distance and size of TV. Interlaced is far easier to tell with anything that has fast-moving frames, like gaming. Progressive scan, 720p and 1080p won't give you much of a difference. And I think you're missing the point here. I read a lot of the articles calling 4K wasteful and no is saying, "Hey manufacturers, don't make 4K TVs." They're saying, "Hey consumers, don't buy 4K TVs." There's a significant difference. Manufacturers are free to innovate and "advance by try new things", like higher-resolution screens. But that doesn't mean consumers should lap it up. If there's one thing I've learned, it's that all these new toys are a waste of money unless they are widely adopted. When the various "content broadcasters" finally adopt their next upgrade, we may be well into the next wave of technology by then (8K or whatever they come up with next). At what point are you just spending thousands of dollars for a bunch of junk that will be obsolete within 2 years when all the 8K products suddenly flood the market? Exactly, Dark Passenger. "Future proof" is rapidly losing its meaning as the consumer technology cycle grows shorter. I bought the Samsung 65" h8000 model. I love it, I agree with keeping the distance to gain the best viewing quality. Not a big gamer, no issues there. With so many new things coming each day, i think it's worth to grab one now, though I'm sure the prices will drop in the future. If it was the same price as non-4K models, I'd agree that it's worth it. But if you paid a premium, I say you overpaid. I have a few 4k screens. There's not a great deal of content for them (there is, however, a surprising amount of adult material). I use 4k screens as computer displays, a task to which they are well suited. I'm not a big enough gamer to really want to game on one, but they're fantastic for just keeping content visible. Sometimes, just having a lot of pixels scratches an itch.